All personal, business and/or tracking information collected by Engineers Edge is confidential and WILL NOT be shared with any third-party without your permission. 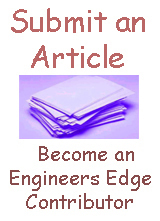 Engineers Edge, LLC provides online engineering, design an manufacturing knowledge resources and tools as well as technicalconsulting and training. For any privacy-related questions, you can reach us at webmaster@engineersedge.com. Each third-party provider has been vetted to ensure that privacy policies and practices meet or exceed the same levels of compliance and standards that we follow. Where appropriate and available, we hold additional signed Data Privacy Agreements with these companies as an additional layer of accountability in order to help ensure your data is safe and secure. An anonymized string created from your email address (also called a hash) is provided to the Gravatar service to see if a Profile picture of you is available for display. We use our own developed script to process all website generated email and communication with our customers. Customers that email us, or use any of the contact forms on our websites, will have their email address, IP address, web browserdata and any data provided in the contact form or body of the email is not stored online however maybe retained in offline databases. We rarelyuse email marketing to communicate with customers and potential customers from time to time. All email lists and campaigns are “opt-in” meaning we will not send you these sorts of emails unless you indicated that you wish to receive them during signup or other interactions on our website. For payment transactions for all services and products we use PayPal and Stripe. All web servers and hosting are managed by our team on the Liquid web platform located in different regions around the world. This includes website hosting, backups, web database, file storage, APIs, and log files. Every Engineers Edge employee and contractor goes through background checks and an onboarding process that includes a trial period where access to customer data is provided only when working directly under the supervision of another staff member. All staff only have access to systems that are directly required to complete the functions of their job. We use dual and triple factor authentication for all critical systems and communications services, and automatically log all staff activity using an internal logging tool. Engineers Edge utilizes third party advertising organizations to serve contextual and other targeted advertisements on Engineers Edge. These adverting organizations may use details about your visit to Engineers Edge networks to deliver targeted advertisements about goods and services of interest to you. May 30, 2018 – Updated language of the policy to be more user-friendly, specifically outlining requirements in preparation for meeting the EU GDPR.